Short Sketches of the Wild Sports and Natural History of the Highlands - Charles St. John 1861 - John Murray, London - New Edition	The classic and entertaining journals of Charles St. John recall a time of natural beauty and diversity of wildlife, from Martens, Ptarmigans, Eagles, Wild Swans and Buzzards to Grouse, Salmon, Woodcock, Stags, Badgers and Grebe. Charles William George St. John (1809-56), English naturalist and sportsman, son of General the Hon. Frederick St. John, second son of Frederick, second Viscount Bolingbroke. Educated at Midhurst, Sussex, and in 1828 obtained a clerkship in the Treasury but resigned in 1834 when his uncle, Lord Bolingbroke, lent him Rosehall, a shooting-box in Sutherland. There he devoted himself to the study of animals and birds. In the same year he married Ann Gibson, the daughter of a rich banker in Newcastle. He and his growing family lived in succession at several rustic residences in the Highlands in Ross-shire, Inverness, Nairn, and Moray and ultimately settled in the Laigh of Moray, within easy distance of mountain sport. 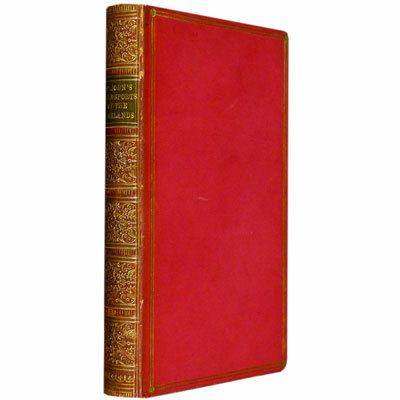 In 1846 he issued ‘Short Sketches of the Wild Sports and Natural History of the Highlands’. The successful work was recognised as that of an accurate observer and a writer of talent. As a sportsman St. John was keen and persevering, but took more delight in seeing his dogs work and in rambling over the hills and moors, taking his chance of finding varied game, than in securing large bags of partridges and pheasants. He was unrivalled as a field naturalist, never accepting facts on hearsay. With the birds of Scotland he was especially familiar. Possessed of considerable skill as a draughtsman, he drew and painted his specimens, and some of his books were illustrated by himself. His works preserve the memory of many curious birds and animals which are now scarcer than they were in his days, and may become extinct. His style is clear and direct, and the genuine appreciation of scenery is apparent beneath the sober details in which the books abound. His writings have sent multitudes of lovers of nature and sport to the rivers and moors of the north. Provenance: With the contemporary gift inscription to William N. G. Eliot from his sincere friend Arthur Morris Lee, On his leaving Eton, 1863.